Nowadays, digitalization is the key element of business competition. This paper analyzes the concept of dynamic capabilities in the context of technological and business digitalization. We investigate the dynamic competence needed to create and manage a new Digital business, which is emerging from the technological transformation. Firstly, in this paper, we analyze the data of Gartner Hype Cycles 2008-2017. Thus, we present a comparative analysis of the changes in the Gartner hype cycle. Secondly, our aim is to present Gartner´s three distinct megatrends. We will present a summary of these Gartner evaluations and discuss key tendencies and trends of technological changes. 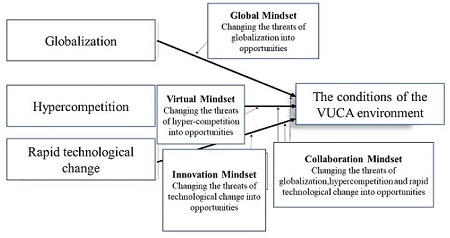 Thirdly, the special focus of this article is the challenges of orchestration of dynamic capabilities in the special conditions of VUCA business disruptive business competition. Further, we define the role of competence gap identification inside a firm. Finally, we are presenting some useful tools to manage dynamic capabilities. C. Jones, Growth and ideas, ch. 16 in Handbook of Economic Growth 1B, Aghion P. and S. Durlauf, internet article published in Elsevier B.V, 2005. C. M. Christensen, “The innovator's dilemma: when new technologies cause great firms to fail,” Boston: Harvard Business School Press, 1997. J. L. Bower and C. M. Christensen, “Disruptive technologies: catching the wave. Harvard business review video,” https://hbr.org/1995/01/disruptive-technologies-catching-the-wave, 1995. C. M. Christensen, H. Baumann, R. Ruggles, and T. M. Sadtler. “Disruptive innovation for social change,” Harvard Business Review, vol. 84, no. 12, 94, 2006. H. Koski, H. Melkas, M. Mäntylä, R. Pieters, R. Svento, T. Särkikoski, H. Talja, J. Hyyppä, H. Kaartinen, H. Hyyppä, and L. Matikainen, “Technology disruptions as enablers of organizational and social innovation in digitalized environment,” ETLA Working Papers no. 45, 2016. D. Nagy, J. Schuessler, and A. Dubinsky, “Defining and identifying disruptive innovations,” Industrial Marketing Management, vol. 57, pp. 119-126, 2016. C. M. Christensen, R. Bohmer, and J. Kenagy, “Will disruptive innovations cure health care? ” Harvard Business Review, vol. 78, no. 5, pp. 102-112, 2000. C. M. Christensen, M. Raynor, and McDonald R, “What is disruptive Innovation? ” Journal of Harvard Business Review, December 2015. C. M. Christensen, M. B Horn, and C. W. Johnson, “Disrupting class. How disruptive innovation will change the way the world learns,” (city): Mc Grow Hill, 2008. J. Paap and R. Katz, “Anticipating disruptive innovation,” Research and Technology Management, vol. 47, no. 5, pp. 13-22, 2004. P. Thomond and F. Lettice, “Disruptive innovation explored,” Cranfield University, Cranfield, England. Conference paper presented at: 9th IPSE International Conference on Concurrent Engineering: Research and Applications (CE2002), July 2002. Gartner Hype Cycle 2008. Figure in the internet article: Gartner Ltd, 2008. Gartner Hype Cycle 2009. Figure in the internet article: Gartner Ltd, 2009. Gartner Hype Cycle 2010. Figure in the internet article: Gartner Ltd, 2010. Gartner Hype Cycle 2011. Figure in the internet article: Gartner Ltd, 2011. Gartner Hype Cycle 2012. Figure in the internet article: Gartner Ltd, 2012. Gartner Hype Cycle 2013. Figure in the internet article: Gartner Ltd, 2013. Gartner Hype Cycle 2014. Figure in the internet article: Gartner Ltd, 2014. Gartner Hype Cycle 2015. Figure in the internet article: Gartner Ltd, 2015. Gartner Hype Cycle 2016. Figure in the internet article: Gartner Ltd, 2016. Gartner Hype Cycle 2017. Figure in the internet article: Gartner Ltd, 2017. J. Fenn and M. Raskino, “Mastering the hype cycle: how to choose the right innovation at the right time,” Journal of Harvard Business Press, 2008. W. J. Abernathy and M. U. James, “Patterns of industrial innovation,” Technology review, vol. 64, pp. 254-228, 1978. J. Fenn, When to leap on the hype cycle: Research note, Stamford, CT: Gartner Group, 1999. K. B. Dahlin and D. M. Behrens, “When is an invention really radical? : Defining and measuring technological radicalness,” Research Policy, vol. 34, no. 5, pp. 717-737, 2005. A. C. Adamuthe, J.V. Tomke, and G. T. Thampi, “An empirical analysis of hype-cycle: a case study of cloud computing technologies,” International Journal of Advanced Research in Computer and Communication Engineering, vol. 4, no. 10, October 2015. Gartner INC., “Gartner's 2016 hype cycle for emerging technologies identifies three Key trends that organizations must track to gain competitive advantage,” http://www.gartner.com/newsroom/id/3412017; 2016. L. Columus, Gartner Hype Cycle for Emerging technologies. Adds Blockchain & Machine Learning for First Time, www.forbes.com, 2016. J. Kaivo-oja and T. Santonen, “Futures of innovation systems and innovation management: Open innovation paradigm analysed from futures perspectives,” in Open innovation: A multifaceted perspective: Part I, ed: World Scientific, 2016, pp. 111-158. M. Keenan, D. Loveridge, I. Miles, and J. Kaivo-oja, Handbook of Knowledge Society Foresight, European Foundation for the Improvement of Living and Working Conditions, Dublin, 2003. D. Loveridge, “Foresight,” The Art and Science of Anticipating the Future. London: Routledge, vol. 11, no. 5, pp. 80-86, 2009. H. A. Von der Gracht, C. R. Vennemann, and I. L. Darkow, “Corporate foresight and innovation management: a portfolio-approach in evaluating organizational development,” Futures, vol. 42, no.4, pp. 380-393, 2010. B. R. Martin, “The origins of the concept of 'foresight' in science and technology: an insider's perspective,” Technological Forecasting and Social Change, vol. 77 no. 9, pp. 1438-1447, November 2010. J. F. Coates, “The future of foresight-a US perspective,” Journal of Technological Forecasting and Social Change, vol. 77 no. 9, pp. 1428-1437, 2010. R. Vecchiato, “Strategic planning and organizational flexibility in turbulent environments,” Foresight, vol. 17, no. 3, pp. 257-273, 2015. R. Rohrbeck and H. G. Gemünden, “Corporate foresight: its three roles in enhancing the innovation capacity of a firm,” Technological Forecasting and Social Chang, vol 78, no 2, 231-243, February 2011. F. Ruff, “Corporate foresight: integrating the future business environment into innovation and strategy,” International Journal of Technology Management, vol 34, no 3-4, pp. 278–295, 2006. R. Vecchiato and C. Roveda, “Strategic foresight in corporate organizations: handling the effect and response uncertainty of technology and social drivers of change,” Technological Forecasting and Social Change, vol. 77, no. 9, pp. 1527-1539, November 2010. R. A. D’aveni, “Hypercompetition: managing the dynamics of strategic maneuvering.” Free Press, 1994. S. Lahiri, P. N. L, and R. W. Renn, “Will the new competitive landscape cause your firm’s decline? It depends on your mindset,” Business Horizons, vol. 51, no. 4, pp. 311-320, 2008. P. F. Drucker, “Essential Drucker: the best of sixty years of Peter Drucker's essential writings on management,” New York: Harper Business, 2008. S. Krupp and P. J. H. Schoemaker, “Winning the long game. How strategic leaders shape the future? ” New York: Public Affairs, US, 2014. J. S. Armstrong, “Principles of forecasting,” A Handbook for Researchers and Practitioners, New York: Springer Science + Business Media, 2001. K. Borch, S. M. Dingli, and M.S. Jörgensen. “Participation and integration in foresight. Dialogue, dssemination, and vsions.” Edward Elgar, City: publisher Cheltenham, UK, 2013. K. Haegman, E. Marinelli, F. Scapalo, A. Ricci, and A. Sokolov, “Quantitative and qualitative approaches in Future-oriented Technology Analysis (FTA): from combination to integration?” Technological Forecasting & Social Change, vol. 80, no. 3, pp. 386-397, 2013. K.-O. Jari and T. Lauraeus, “Analysis of 2017 Gartner’s Three Megatrends to Thrive the Disruptive Business, Technology Trends 2008-2016, Dynamic Capabilities of VUCA and Foresight Leadership Tools”, AITI, vol. 4, no. 2, pp. 105-115, Mar. 2019.